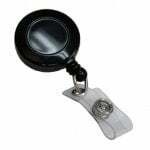 These heavy-duty badge holders are available in three colors: white, black, and clear. They can be ordered in a horizontal (landscape) or vertical (portrait) format. 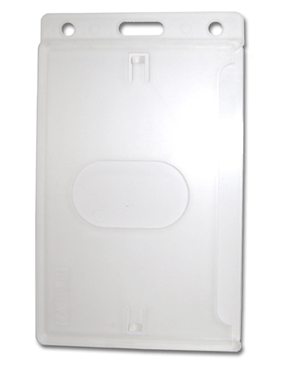 They are designed to allow the ID card to easily slide in and out of the holder, yet maintain the card securely and visibly. We can also procure custom-colored badge holders if that is required. These reinforced badge holders are made of clear, hard plastic. They have a clear plastic front, protecting both the front and the back of the ID card. They are available for ordering in a horizontal (landscape) or vertical (portrait) format. The ID card can be easily slid in and out of the holder. by employees who move around a lot, and must keep their badge out of the way. Lanyards are by far the most popular way to carry ID cards in a convenient yet visible manner. Our sturdy, comfortable lanyards come in white, black and blue, and available for immediate delivery. We would be pleased to provide custom lanyards in a wide range of colors with personalized printing including logos for a truly unique ID solution. Our clips provide an easy and unobtrusive way to display an ID card for those who prefer not to wear it around their necks. 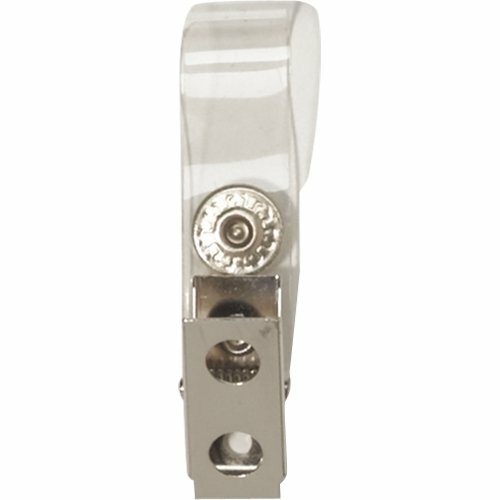 Clips allow easy attachment to pockets, belts, and lapels without damaging clothing. 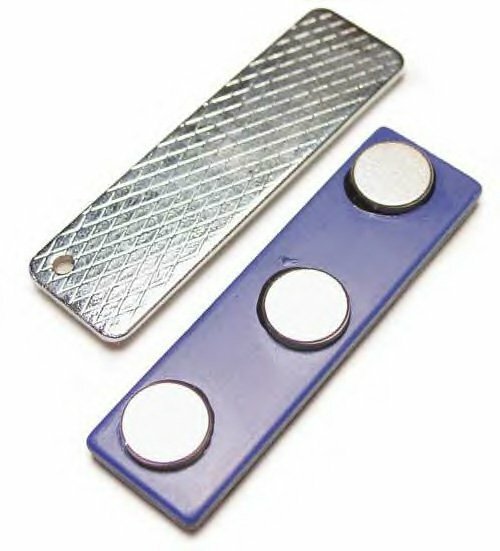 These are probably the most commonly used, low-cost method of attaching a badge. 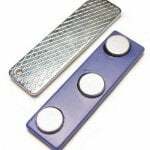 Magnetic badge holders allow employees to display their ID cards on their clothing without pin-holes or damage. One part of the badge holder attaches to the back of the card with a strong, permanent adhesive. 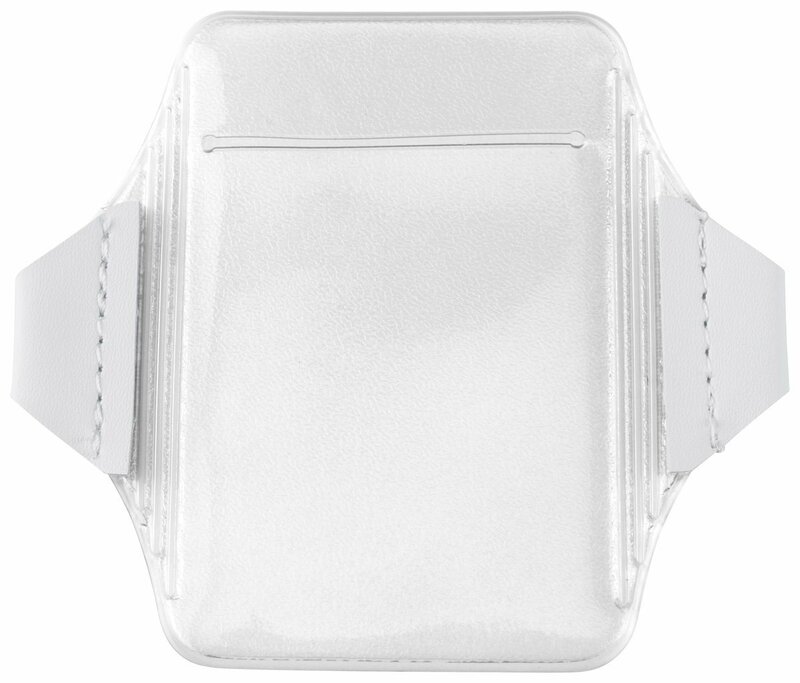 The other part holds it firmly in place through the pocket or other material. 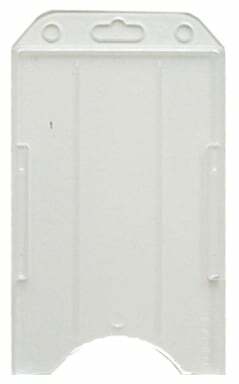 Size: 1 3/4″ x 1/2″. 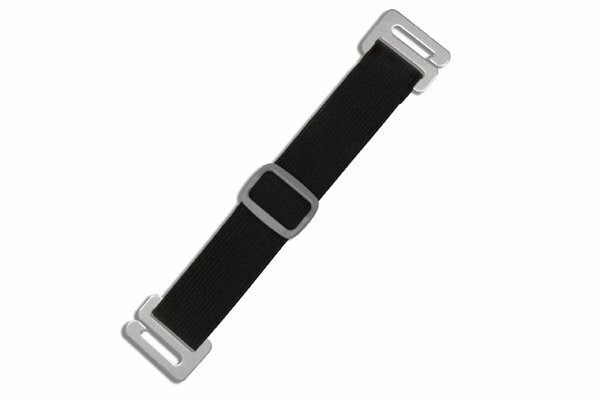 Zip reels have a retractable cord for attaching the ID card to a beltloop, and making it easy to extend the card for swiping to enter a building, or for swiping in a time clock. Standard reels are available in black. Custom reels can be ordered in a wide range of shapes and colors, and can also be imprinted with your company logo. If you have any special/unique requirements (color, monograms, format, etc) please give us a call. We pride ourselves on being customer-driven, which means that meeting your needs is our number one priority! We can supply virtually any accessory at very competitive prices, including yoyos, magnetic clips, windscreen holders, etc. If you would like advice, or wish to discuss your unique requirements, please call us. When you click “submit”, your order will be immediately processed. Accessories will be shipped within 24 hours. If possible, we will combine accessory orders with concurrent ID card orders, when you order accessories online. All charges for accessories like lanyards, badge holders, or clips are deducted from your InstantCard account.